The sun! It's finally here! 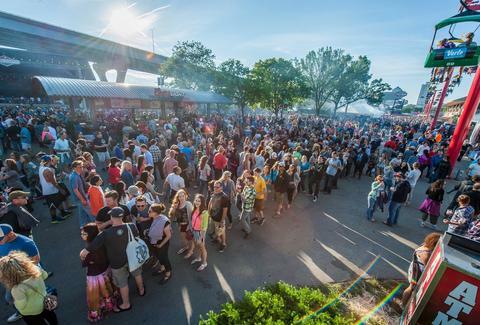 The summer in Milwaukee is so short that we make the most of it, throwing festivals and parties for just about every occasion -- or none at all (what, the fact that we make beer here all year long is totally a reason to throw down in the summer). Here are the best things to keep you off the streets and out of trouble -- or in the streets and in trouble, more likely -- this summer. Editor's Note: Check out our summer concert and outdoor movie calendars for even more ways to take advantage of the warm weather. Shop for art of all kinds at this curated art festival, plus kids can do art activities. If you don’t already like art, you’re about to. Eat all the kielbasa you possibly can, and then check out the Non-stop Polka Stage. Not only do you get unlimited beer samples, you get unlimited food too. Try to pace yourself. A parade, street festival, and Freedom Ball are all part of the event. Whatever you do, do NOT miss the loukoumades donuts at this festival full of great food and cultural exhibits. Three stages of local music, plus a maker's market of arts and crafts, are what make this festival great. Unless you're one of the two people in the world that hates strawberries, this festival's for you. Celebrate all things garlic with food, distillers, brewers, and Braise's green garlic bloody marys. If we have to tell you what Summerfest is all about, then you're probably not a Milwaukeean. Drink PBRs unironically while listening to local bands and browsing the craft fair. Eat crepes, drink wine, and be scared by street performers who act like statues under a giant replica Eiffel Tower. It's back this year, rain or shine. Galleries, museums, and shops team up for an art-centric experience. Play bocce ball, eat calamari, listen to some opera, and watch some fireworks. What could be more Italian? This beer fest boasts over 50 casked firkins, which are small wooden barrels often used to condition beer. That’s really all you need to know. Teams race around a 4.6-mile route, scoring as many points as they can at checkpoints in 24 hours. If that sounds exhausting… well, that’s because it probably is. You'll be surrounded by "ziggy zaggy" chants all day long. Four music stages featuring local bands, plus beer, art, and probably some weird surprises. Sample beer, cider, and mead from over 100 breweries, and then high-five yourself for leaving your car at home. Michael Ian Black headlines this year. Enjoy live music while you scarf meat from local barbecue spots. Bacon-wrapped water chestnuts… beer-battered brat bites… what crazy concoctions will the food vendors come up with this year? Follow the parade from Zeidler Square Park to the festival grounds, and enter a raffle for a chance to win the grand prize (last year’s was a brand new Harley). No, you won’t be feasting on endangered beasts; there’ll be food stalls set up all around the zoo, which is probably a lot better than biting a zebra. Expect amateur boxing, native art, and plant walks on Lakeshore Park. This music-focused cultural party is the largest Irish festival outside of Ireland. If that's a little too spicy for you, consider eating as many tacos as you can instead. Buy your own sari or dhoti in the marketplace, grab a masala dosa for lunch, and get ready for some serious synchronized dance moves. This annual meeting of Harley-Davidson riders includes festivals, rides, music, and BBQ. Oh, and a crap-ton of bikes in all shapes and sizes. It’s everything you could ever want in a street festival: shops, books, art, food, beer, and entertainment.